The paper deals with statistical analysis of engineering data set. The purpose of analysis is to stipulate suitability of formulas that compete for being involved in prepared EuroCode that will be valid from 2020. Authors dispose with a sufficient numbers of lab tests. Having input geometrical and physical parameters of each experiment at hand, the corresponding theoretical value is computed by using three formulas provided by three models. Case by case, the ratio between measured and theoretical value reveal the safety immediately: greater then one means safety, less then one means failure. This ratio stands as the one parametric dimensionless statistical variable which is analysed afterwards. 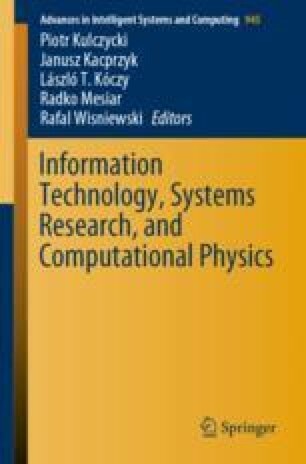 The preliminary version of this paper was presented at the 3rd Conference on Information Technology, Systems Research and Computational Physics, 2–5 July 2018, Cracow, Poland . This work was supported by grants APVV-14-0013, VEGA 1/0810/16 and VEGA-1/0420/15.